As a creative, I tend to look at things from a visual perspective. I admit – I am that person who purchases a bottle of wine based on the label and a book by the look of its cover. Creatives aren’t the only ones prone to doing this, though. We all like to look at things that appeal to us and that we consider visually pleasing, whatever our definition of visually appealing might mean. It makes total sense then, that when you consider the look for your website, your first thoughts are based on what you find appealing. But what will your target audience think of the look that appeals to you? What appeals to you might be a feminine look, with pastel colors and lots of texture. For your target audience, it might be modern, jewel tones and limited textures. If you don’t understand your target audience, you may be way off base in who you are actually designing for and it might cost you in the long run. Pretty sites that frustrate users aren’t useful, they’re just pretty. That wine with the pretty label tasted awful. The book with the impressive cover was one of the most boring books I’ve tried to read in ages. You can have the prettiest site on the block, but if that’s all it is, it’s not going to convince anyone to stick around or convert anyone to purchase what you are selling. Your site layout, organization, and contents require, and deserve, just as much consideration as what it will look like. Failure to make these things a priority will result in lackluster performance. So I can’t have a pretty site? The look of your site is a fine thing to consider, but it’s not the approach to start with when you are redesigning your website. In fact, when I work with clients, the design is not even discussed until I have a full overview of the business needs, the target audience, current business and marketing problems, goals and more. In other words, what problems are we trying to solve, what goals are you wanting to reach and who are we doing this for? That is what should guide your website redesign. 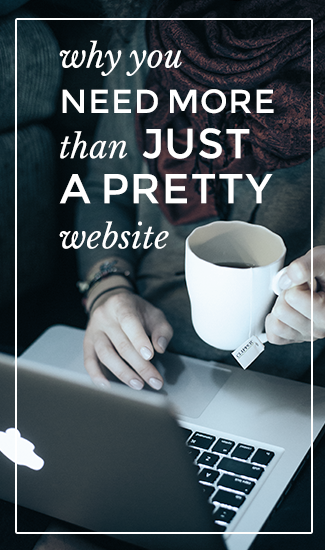 So go on – build a pretty site! But first, take the time to do your homework and make sure that you are building not just a pretty site, but one that is useful and helpful to your target audience, and makes your audience want what you have to offer.